Daitokuji is the famous temple complex. Koutouin is famous place for the autumnal leaf coloration. It is famous in Japan by train company ads that features Kyoto. Right now is the very good time to visit here, why don't you come to Kyoto? We now have schedule for our New Year event! 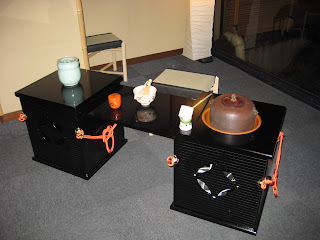 "New Year Tea ceremony (Hatsugama) and regular Tea ceremony"
Hatsugama means the first Tea Ceremony of the year. The Tea Ceremony held in very first time of the New Year is very important. It started as the gathering of the whole Tea School. To start the new year, everyone dress up gorgeously to do the ceremony. In NISHIYAMA RYOKAN, you do not need to dress up, we just hold the Tea Ceremony as the start of New Year.